The master bathroom has its own access to the master bedroom (main bedroom). The WC is in a separate room with private access. The bathroom has a large walk-in shower and a separate oval bathtub. Two sinks and a makeup table round off the 30 qm, light bathroom. The 2nd bathroom has a bathtub with an integrated shower and has a second exit to the pool deck. We had a wonderful stay in this home. Very nice and suited all of our needs. Great accomodations and maintenance. Location not to all tastes. The property itself is new, light, spacious, clean and well outfitted. Virtually everything works as described and the owners have been careful to provide thorough instructions. They are also very responsive to questions, and the management company is also prompt and helpful. Cape Coral would not be my first choice for a vacation--sooner Sanibel--but it's a solid, credible choice in the area, and there are interesting places to visit nearby. The house itself we would be pleased to return to. Renting bicycles might be a good option for some visitors. Would highly recommend this house to everyone!! We stayed the beginning of December 2017 for just over a week. It was myself, my husband, and our dog. I loved the layout of the home. The master bedroom and huge master bath are on one side of the home with the other 2 bedrooms and bathroom on the other side. Everything from the decorations to the furnishings were nicely appointed. The kitchen had what we needed to make meals while we we there. A few more large mixing bowls would be great but other than that it was fully stocked!! The bedding was great in all the bedrooms and overall the house was nice and clean! We had just 2 adults, but if you had up to the 6 people the home can accommodate, the living room could become a bit small for everyone. You can easily use the dining room chairs for extra seating. The outdoor area was great. The pool is a great size, the loungers are really nice with an umbrella supplied as well. You get sun the entire day on the lanai which is awesome. It was too bad they didn't have a hot tub to use for those chilly nights!! I would absolutely stay at this home again and highly recommend anyone to book this rental. The neighborhood is super quiet and safe. You are a 2 min drive to a gas station and Walgreens and in super close proximity to restaurants, bars, etc. You're roughly 30 minutes from both the airport and Ft Myers Beach. My only recommendation would be for management to clean off the lanai a little better before guests arrive. There were a lot of cobwebs I had to clear off and some dead bugs along the edge of the lanai that could've been swept up, but this was a very minor issue. I would love to stay here again in the future!! Villa Angela was a lovely place to stay. For two weeks we enjoyed the well appointed house and pool area. The home was located conveniently to a grocery store and restaurants. Quiet neighbors. After renting houses for 2 years, this house was a dream. It was comfortable, nicely furnished, clean, and well maintained. I appreciated having the home inspection upon arrival and exiting. We rented for 2 months this winter for our southern getaway. It is a lovely home! We wanted a place that brought the outdoors in. You can do this by sliding the glass doors open and enjoying the sitting area at the pool. It is a well equipped home. Was very clean. When ever we had a question we got a fast response from Chris. He is very easy to work with. The pool is heated. We like our pool a little warmer than most people and we were able to adjust the temp. We did go over our allowance for the electric, but for all the time we spent in the pool, it was well worth it. Lots of good places to eat in walking distance. We enjoyed it very much! Cape Coral is located directly on the Gulf of Mexico and is the ideal starting point for diverse excursions and activities. Our house is located in a peaceful and central residential area. Cape Harbour can be reached in about 5 minutes. Shopping centre with all stores (Publix, Walmart, Pizza, Mc Donalds, Chinese food, video rental, pharmacy, drug store, hairdresser and a lot more) is located nearby (about 3 min. by car). Fort Myers and its beaches can be reached quickly through two bridges. Along with Sanibel and Pine Island. Sanibel has countless charming beaches. Orlando with its amusement parks (Disney World) is about 2.5 hours away by car. 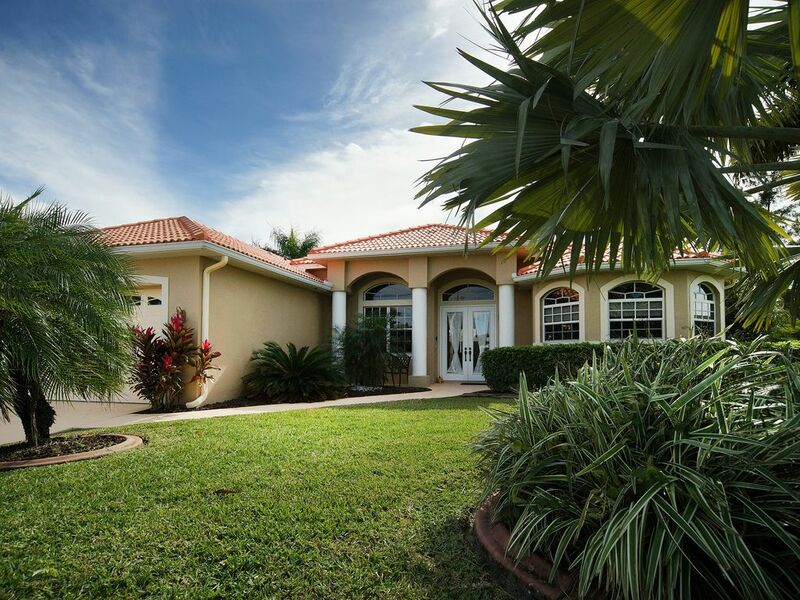 Golf: In Cape Coral and nearby you will find countless golf courses. The golf courses can be reached easily and each is operated to your complete satisfaction. More information about the golf courses can be found on our home page www.florida27.com. Die oben genannten Preise sind Komplettpreise zzgl. der zu entrichtenden Steuern (zur Zeit 11,5%.) in Cape Coral. Bei uns gibt es keine Ferienzuschläge, Zuschläge bei der Belegungsanzahl oder dergleichen. Die maximale Belegung: 6 Personen. Endreinigung: 180,-- US$ vor Ort in bar. 35,00 US$ Strom inklusive. MEHRverbrauch ist vor Ort in US$ und in bar zu zahlen. Haustiere nach Absprache. Zusatzreinigungsgebühr für Haustiere: 100,00 US$. Aditional fees: 180,00 US$ for cleaning fee, payable in cash at check out. 35,00 US$ electricity per week is included. The maximum occupancy is 6 persons. Additional cleaning fee for pets: US $ 100.00. Pets by arrangement.